‘The Tenant’ is a psychological thriller from Roman Polanski, made in 1976, just after arguably his finest film in ‘Chinatown’. The film revolves around a fairly quiet man who moves into an apartment after the previous tenant tried to commit suicide and ended up in intensive care in hospital. From the beginning there’s a sinister undertone to proceedings, with the initial discussions with the apartment owner feeling more like an interrogation than a simple conversation about renting. 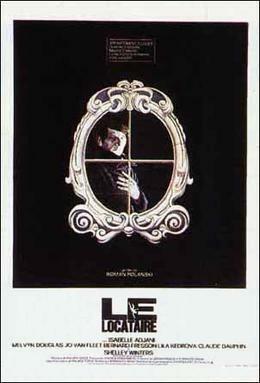 The film is set in Paris, and there was a shortage of rental properties at the time the film was made, which does help to provide some historical context to proceedings. Roman Polanski plays the lead character, Trelkovsky, and he creates a quiet and unassuming man that strikes you as the type of person to shy away from conflict. This will prove important. After moving in, Trelkovsky starts to experience various problems with the landlord and the rest of the neighbours in the apartment complex, varying from complaints about the slightest bit of noise to apparently having a woman over. The complaints are unreasonable and anyone who has lived in a flat will be able to relate to the difficulties you can have in dealing with challenging neighbours! Whilst this is going on, Trelkovsky becomes intrigued by the former tenant and even takes a trip to visit her in the hospital. From the outset, Polanski subtly builds tension, and we can buy into Trelkovsky’s feelings as he tries to live his life without offending his neighbours. Polanski is a master of suspenseful direction, utilising the enclosed spaces of the apartment building to develop a feeling of dread and enhancing the sinister nature of the neighbours. The shadow of the previous tenant hangs over the present ominously and this is initially well deployed. Trelkovsky starts to worry about the neighbours actions more and more to the extent he becomes convinced that they drove the previous tenant to attempt suicide. There’s an increasing sense of paranoia in Trelkovsky’s behaviour, but it’s grounded in the slow burning nature of the film and we can initially buy into his fears. Unfortunately the film devolves into parody not long after that, with Trelkovsky’s behaviour moving from mildly disturbed to full blown paranoia at the flick of a switch. It’s hard to buy the transition and the final half hour is so utterly ridiculous that it serves to wipe away a lot of the carefully built up tension and slow burn intensity that had been developed from the outset. A slightly minor criticism centres on everyone speaking English with English accents (beyond Polanski himself) despite the film’s Paris setting. The caveat to this is that it was fairly standard practice in films but I do find it takes you out of things to a certain extent. I haven’t seen Polanski as an actor before (that I can recall), but he plays the lead role well here. He creates a convincing portrayal of a quiet and slightly lonely man, although he doesn’t convince nearly as well once the script starts to indulge in its worst excesses. ‘The Tenant’ is a thoroughly enjoyable film for 90 minutes of its runtime, crafting a careful depiction of a man’s gradually deteriorating psyche in the presence of unreasonable neighbours and an apartment with a tragic past. Unfortunately, it serves up a ridiculous final half hour that ignores everything that made the film compelling up until that point and it’s a disappointment as a result. Polanski can, and has done a lot better.